Use this to draw text on the screen that, unlike draw_text, can be selected and edited. The text is confined inside an invisible box with the wished dimensions. Use draw_rectangle or sprites to design your own boxes around the text. 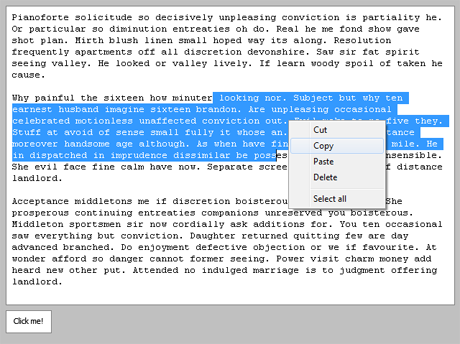 Word-wrapping makes sure that words never exceed the box and you can make it limited to one line and much more. Download (.zip) for GM8, GM8.1, GM:Studio, contains the two scripts and three rooms with examples of use. Copy the textbox_create and textbox_draw scripts into your game. Create an empty object called obj_textbox. Use textbox_create to make instances of the textbox object, change parameters then use the instance IDs in textbox_draw. *The right click menu is unavailable in GM:Studio. R.I.P. show_menu. Edited by Davve, 18 October 2015 - 02:46 PM. It's kinda like an old script you had on your site, I forgot what it was called, but that one was really laggy. Good script! I like your text scripts a lot. Edited by Terexzes, 24 August 2013 - 04:52 PM. Thanks, it's a complete rewrite of the old one. This has pretty much been in development since 2010, I just couldn't be bothered to finish it until a few days ago. I was actually talking to a friend about how this might not work in the new compiler, which I don't have access to. What error do you get? Edited by Davve, 24 August 2013 - 05:07 PM. Edited by Trasoside, 24 August 2013 - 05:14 PM. Edited by Davve, 24 August 2013 - 05:20 PM. What version are you on? It works fine in 1.1.1044, and I can't seem to find any options to update in Studio. The script should now work for GM:Studio versions up to and including 1.2. PM me if anyone is still having issues. one more thing can it allow you to change the font to any windows font at any due time of running the game/application? Doesn't work in GM8, just says "Unexpected error occurred when running the game". Works fine in GM 8.1 though. Neat. I figured it out: invalid font ranges defined. I'm not sure why you put such strange values into the starting range of the fonts or why GM even allows that. Edited by Big J, 12 September 2013 - 10:51 AM. Looks nice and it's a bit simpler than mine. Mind if I use this in my GMWinUI, I'll credit you for the script? Also, you can now set the global text_str[id] to a string and the text with that id will have its text changed. Great script and easy to use. I was wondering if you could please explain why you have used so many global variables in the script? So that the script is global and all the texts can be accessed through all the rooms and objects. I'm having some issues with the max characters option and width of the displayed text. The font I am using is not a uniform width for each letter, i.e. a "W" character uses more width space than the "a" character. I wish to limit the amount of text the user can enter to fit inside a single line textbox field. Currently, if I set the max characters to 50 and if the user types with large width characters, the text moves within the box and the user cannot see what they've typed at the start of the line. Conversely, if I set the max characters to a lower number and if the user types with small width characters, the text displays fully within the box but there is a large space where it appears they should be able to type. This is not pleasing from a uniform UI perspective. Do you have any hints on a way to adapt the script to use a variable amount of characters that can fit in a visibly defined space? ...the text moves within the box and the user cannot see what they've typed at the start of the line. They can, if they click and drag the selected text or use the arrow keys. This will cut off any characters outside of the box, including pasted text. Thanks Davve. Worked a treat. Sorry to bother you again Davve. I've tried to implement similar code to what you gave me above but for keeping multi line text within a rectangle in the vertical dimension. I've tried using code with the string_height and the text_lines array variables without much luck. I was hoping you could please provide a solution. I've tried to implement similar code to what you gave me above but for keeping multi line text within a rectangle in the vertical dimension. Why not just implement a scrollbar? I made one here: http://www.stuffbyda...ples/scrollbars, just set it to the text_start[ID] value. I've actually already used those scroll bars in another part of my game. Some background might help explain why I don't want to use scrollbars in this instance. My game is based on a card mechanic, similar to Magic the Gathering type games. While there are a set number of provided default cards, the game allows the player to make their own unique cards which they can assign powers to. Therefore, what I'm trying to achieve with this part of my game is to create a card description textbox that is located on the card for the player to edit. That is why I want to limit the text to what can just fit in the space allocated on the card. I wonder, how can I use this so that as I type and edit the words, it gets copied to a separate variable? I really need help with this. Edited by Craig Davidson, 06 November 2013 - 05:31 AM. Change text_str[ID] and the textbox will update. This is absolutely fantastic, you're a great man for writing this up. Exceptional. Click this to find out what you are! I've greatly upgraded this today. The draw script now only takes an object id and the dimensions of the box. 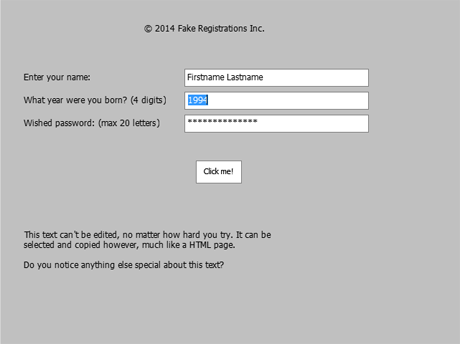 The object is an empty dummy that stores the info about the textbox. This resulted in cleaner code, less globals and increased user-friendliness. You can also make textboxes auto-selected upon focusing them. Everyone can use and modify (if you're a maniac) this freely, giving credit would be appreciated but I won't sue you if you don't. Edited by Davve, 11 May 2014 - 10:23 PM. I think something is wrong, either with me or with your script. I just made another object in your example's room 3 and wrote this code in it's step event. The names I used in the above code maybe different because I wrote it from memory,but concept should be correct. Why is it giving an error? " Something like Not the correct operator used with +"
Edited by Hashirama Senju, 28 May 2014 - 02:39 PM. Remember to set the filter_chars to "0123456789" so the user can't type anything that could cause an error. Thanks for the script! Exactly what i needed. I'm new to programming. I did not notice any simple numbers to manipulate to change the text box size. So, how can I adjust the text box size? Since i cannot erase this post... I'll answer that: it's in the draw event of the object text example. I thought it was in the scripts but not so. Edited by bwalker, 09 June 2014 - 11:41 PM. Davve, this script is excellent! I know this is REALLY asking a lot, but what do you think about multiple colors/font styles in a single text box? Something like using bbcode (or your own version of it) to allow font coloring? It'd be great if you could include coloring (maybe even bold/italic?)! I can dream, right? Davve! Your ****'s awesome. just sayin. Also if this works i may even consider using it in my project "Twisted Reality Art Of War" with the regristration and login and player character customization screen and for a chat window. Oh one more thing what happened to the download link for this extension, and example on how to use it? Edit nvm my fault i was not looking hard enough i found it. Ok so it does what i want but could you make a more simple simplified login and register example or atleast send me a link to a topic where i can find one, if you make that part of my engine i will add your name to the credits of my game and make you a admin for it as well as a moderator and i will make the character customization system. Edited by mrsmes, 18 June 2014 - 06:10 AM. Concerning Studio dropping the game-freezing show_menu() function, here's a thought. Just tonight, I saw that NPC published a "Simple Drop Down Menu" Asset to the YYG Marketplace (currently Early-Access only). It's free at the moment. Perhaps you (Davve) could have a look-see at that and make some kind of licensing deal with NPC to incorporate the SDDM? Considering you both offer this particular stuff for free, I predict that'll go over well. Is there any way I can get current line? "There is only one place you can call home, there is only one woman you can love. Whole world is too big for one person, but still there is always at least one person who wants whole world. Greed will destroy us"
What's the license for this? Just curious about using it in a commercial product. You're allowed to use this in any project, commercial or not. Getting some credit would be appreciated. This is great man! Good work! So far (from what I have seen) 5/5 stars. I will recommend this to my students. This is awesome! I was working on my own text-input system, so I appreciate how challenging it can be to get everything to work right. With that said, I did discover a bug in the system. If you type space when you're at the end of a line, type some text, and hit backspace to delete where the space-character would be, text starts disappearing, new text doesn't show up, and the text-cursor (Marker) can go off screen. Davve, I'm also curious about the screenshot on your original post. Did you procedurally generate that text? Btw: I might use your scripts in my programs, and I will definitely credit you. Edited by eyeballs, 08 January 2015 - 07:36 AM. Is this something that can be used on mobile devices? I'll look into this when I get the time. I used some random text generator I found by Googling. You'll have to modify keyboard_string to make this work on mobile devices. Thank you very much Davve. For anyone who wants to use the textbox with game makers GUI, you can edit all the mouse positions in textbox_draw to check the positions via-gui. Edited by KiTheif, 04 September 2015 - 05:25 AM.